Steve is in Wichita to see Baseball Around the Clock and came to Hutchinson late this afternoon to have dinner with us. It was great to see him. Steve is one of those people I never have enough time to talk to. He's a really fascinating person. He loves to travel and most recently visited South America. He thinks in different ways and I really enjoy conversation with him. 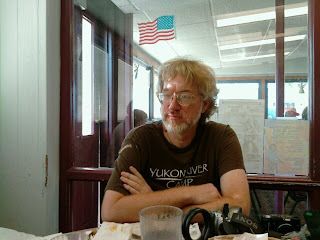 Steve reads this blog regularly, which flatters me. He tells me I make him think, which I take as a huge compliment. He mentioned to me tonight that I'm the most introspective person he knows. Earlier in the day Martha emailed, referencing the same sort of thing. Of course I only have access to my own thought process so cannot compare it to how other people think. On some level I guess I am pretty much always in an introspective mood. As I take in new information I contemplate it in the context of things I already know or think, and come up with new thoughts. I spare blog readers from all of that most of the time. But, obviously it slips in more than occasionally.